Background: United Way of Greater Cleveland’s goal is to break the cycle of poverty in the Greater Cleveland area. Education is the first step to achieving this goal; so, United Way is working to help community members better understand the cycle of poverty affecting the area. 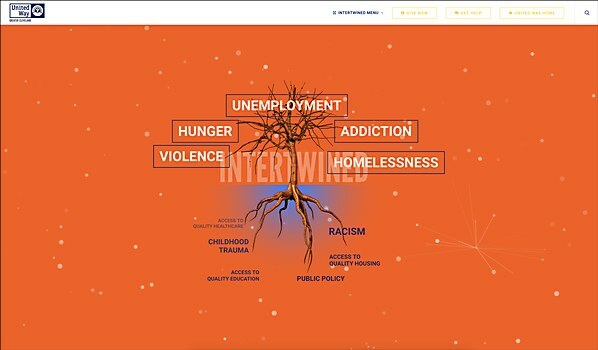 United Way does this by getting people to think about more than just the visible signs of poverty that people see on the news or in the streets. What people don’t see or think about is why people end up in poverty in the first place. Poverty is much like a developing plant, with the deep root causes growing and sprouting into visible problems. 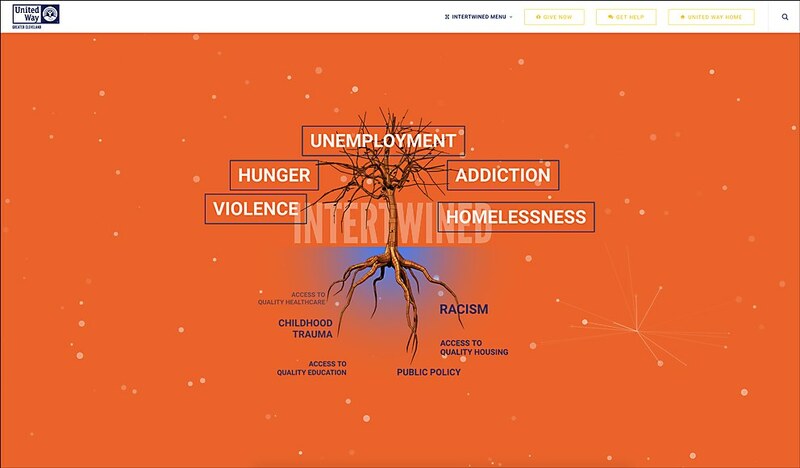 The Intertwined site uses the concept of a tree to illustrate and educate this cycle of poverty with the end goal of inspiring action from the community to create lasting change through donations, advocacy and volunteerism. Highlights: Extensive research and surveys went into the design of the site. 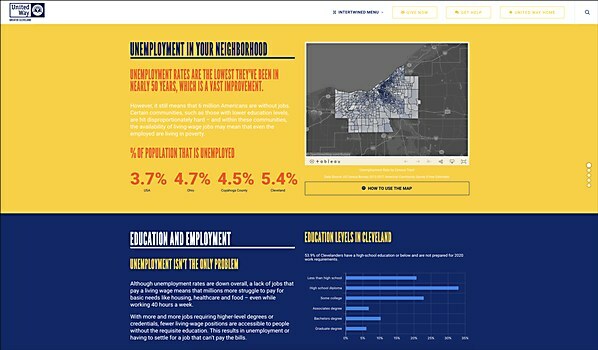 The UX/UI design was developed based on user surveys, and the data survey and analysis were completed by the United Way of Greater Cleveland Community Impact and Marketing teams. The integration of custom multimedia content and photos with a dynamic data display and compelling layout enables the piece to show the many aspects in a concise manner. 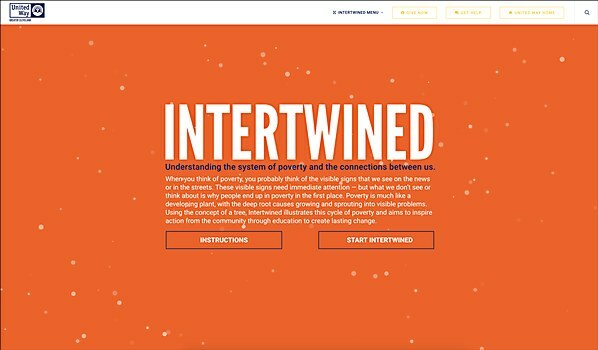 Challenges: With a topic as complex as the cycle of poverty, it was a challenge to pare down the extensive data into a seamless narrative that wove together personal stories and hard data. 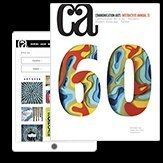 Compacting this into an effective manner was a hurdle, but user surveys of site content and layout for emotional and logical responses helped to narrow down focus points and design layout. Navigational structure: A key component of the navigation is the page scroll feature. 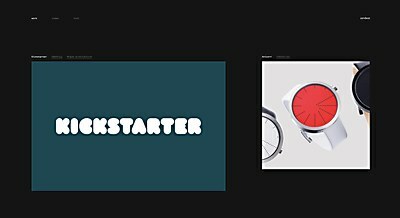 Each scroll presents a new slide that divides the story into a logical display that summarizes the underlying problem and cause, the statistics and data behind the problem, solutions to break the cycle and a call to action for donations. 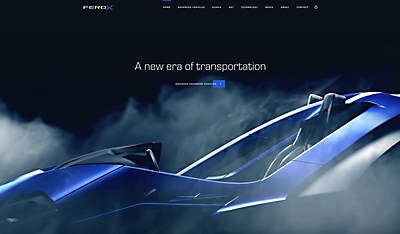 Technical features: The site was built on a highly customized WordPress theme utilizing a module approach for development, so any component of the page can be repurposed in other stories. One of the tools used for data visualization was Tableau. It enabled us to create powerful and insightful maps that depict geographical data on different poverty issues. Big data was plugged into the system to help users see and understand the statistics in visual form. 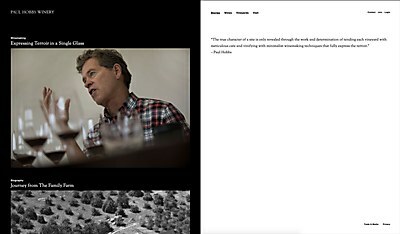 Simple, yet technical, Order’s new site showcases its work in a neat and organized way.